Manchester United manager Jose Mourinho wants club scouts to run the rule over three Croatia players at today’s World Cup final against France, it has emerged. 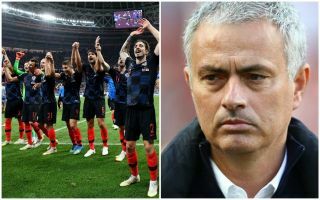 CaughtOffside understands Mourinho is keen on three potential signings from this impressive Croatia squad, with Ivan Perisic, Mario Mandzukic and Sime Vrsaljko firmly on his radar this summer. Inter Milan winger Perisic has already been strongly linked with United, with a report from Get French Football News stating talks to land the 29-year-old may already be at an advanced stage. Old Trafford sources have informed CaughtOffside that negotiations may not be so advanced just yet, but that interest from United remains strong after initial efforts to sign Perisic last summer. Given the Manchester Evening News recently quoting Anthony Martial’s agent as claiming his client wants out of the club, a move for a new wide-player seems logical. Mourinho will now ask United scouts to take a closer look at the player in today’s match against France, while two of his team-mates are also set to go under the microscope. Versatile Atletico Madrid full-back Vrsaljko is also being looked at, and the Daily Mirror also linked the 26-year-old with the Red Devils a couple of months back. Despite already bringing in youngster Diogo Dalot at right-back this summer, Vrsaljko could be a more ready-made upgrade on the ageing Antonio Valencia to go straight into the team, whilst also providing an option on the left-hand side as an alternative to the unconvincing Luke Shaw. CaughtOffside understands that Vrsaljko’s form at this World Cup has pushed him up Mourinho’s agenda, but he wants to see how the player performs in this big game today against a quality Les Bleus attack. The defender also only recently signed a new contract with Atletico, which could make him the trickiest of the three signings to complete. Finally, Gianluca Di Marzio have linked Juventus’ Mandzukic with United in recent times as well, and he’s been another hugely impressive member of this Croatia squad. Having scored the winner in the semi-final victory over England, Mandzukic has once again worked his way onto Mourinho’s radar as the Portuguese looks to add depth to his strike force. Romelu Lukaku was first choice for so much of last season, and with Zlatan Ibrahimovic leaving there’ll be even more pressure on him, with little option to rotate. A battling, experienced forward like Mandzukic could be ideal for this United side, and CaughtOffside understands United scouts have been instructed to monitor him closely as well today ahead of a potential swoop, while the Daily Express have suggested an exit seems on the cards for him following Juve’s signing of Cristiano Ronaldo. The Daily Mirror also linked West Ham’s Marko Arnautovic with United earlier this summer for similar reasons, but those stories have died down of late.